Behind the ear (BTE) hearing aids are housed in a case that fits neatly and comfortably behind the ear. A custom ear mold, made to the exact shape of the individual’s ear, is used to direct the sound from the hearing aid into the ear while also securing the instrument in place. BTE hearing aids are appropriate for a variety of hearing losses, ranging from mild to profound. Because the components of a BTE hearing aid are housed outside of the ear, these instruments tend to be the most durable. Thus requiring fewer repairs and having a longer life expectancy. In the ear (ITE) hearing aids are custom made for each individual’s ear. ITE hearing aids are a single unit which fills the bowl portion of the ear. When properly made, in the ear instruments fit comfortably and securely in the ear. These instruments have no external wires or tubes, and are very lightweight. ITE hearing aids are appropriate for hearing losses ranging from mild to severe. In the canal (ITC) hearing aids are custom made for each individual’s ears. These instruments are smaller in size and fit more deeply into the ear canal than in the ear hearing aids. 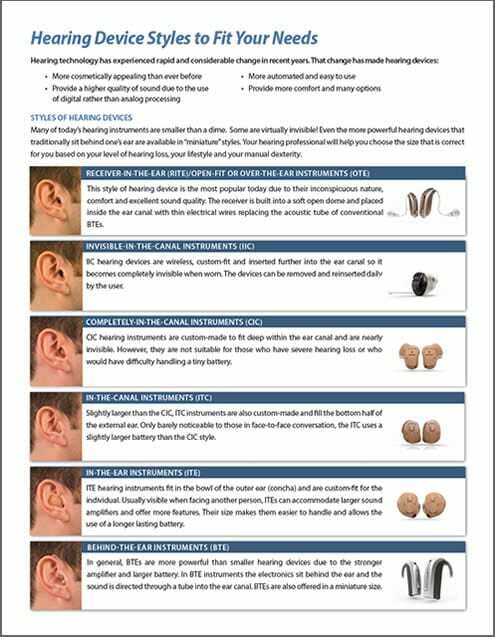 ITC hearing aids are appropriate for hearing losses ranging from mild to severe. Receiver in the Canal (RIC) instruments are mini behind the ear instruments which provide the most natural sound quality because they leave the ear canal open and eliminate the feeling of being “plugged up” or “in a barrel.” Only the frequencies that have hearing loss are enhanced, while the listener is able to make use of their remaining “normal” hearing. Completely in the canal (CIC) hearing aids are custom made for each individual’s ears. These instruments are seated in the ear canal making them less visible than in the ear and in the canal custom instruments. The design of CIC instruments also assist in the reduction of wind noise and feedback. The small size of CIC hearing aids make it necessary for its users to have good manual dexterity as the components are small and can be difficult to manipulate. CIC hearing aids are appropriate for hearing losses ranging from mild to severe. However, it should be noted that some people may not be candidates for these instruments as the shape and size of the ear canal may not be large enough to accommodate the hearing instrument’s internal components. Invisible in the canal (IIC) hearing aids are custom made for each individual. These instruments fit farther into the ear canal than the completely in the canal hearing instrument making them the least visible hearing aid available. Like the completely in the canal hearing instruments, the size of IIC hearing aids make it necessary for users to have good manual dexterity as the components are small and can be difficult to manipulate. Fitting IIC hearing aids may involve additional appointments and possible modifications to the hearing instruments in order to achieve the most appropriate and comfortable fit. Invisible in the canal hearing aids are appropriate for hearing losses ranging from mild to moderately-severe. However, it should be noted that some people may not be candidates for these instruments as the shape and size of the ear canal may not be large enough to accommodate the hearing instrument’s internal components. Regardless of style, hearing aids work in two different ways depending on how they are electronically programmed. These aids convert sound waves into electrical signals which are then amplified and transmitted back to the ear. They can be custom-made to fit each patient's hearing needs. They can altered by the patient and customized for different listening environments. Analog aids can be used in any style of hearing aid. Digital hearing aids convert sound waves into numerical codes and then amplify them. Some frequencies can be amplified more than others. Digital aids can also be programmed to focus on sounds coming from a certain direction. These aids tend to be more expensive than the analog variety.